Background: Despite recent advances in the construction of graphene/TiO2 hybrids with tunable structure and morphology, the synthesis of graphene/beta TiO2 nanocomposites with welldefined morphology remains a challenge. Objective: We report for the first time a novel array structure consisting of porous ultrathin beta TiO2 nanosheets grown on few-layer graphene. Method: Pristine few-layer graphene (FLG) was first effectively exfoliated and dispersed in ethylene glycol. 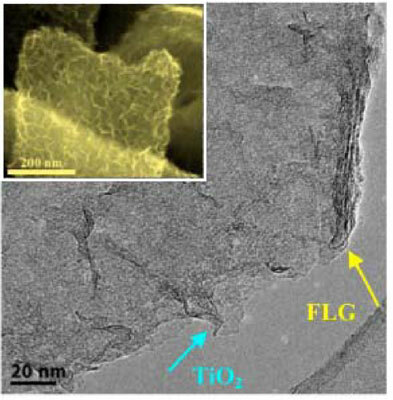 Then porous beta TiO2 nanosheets were synthesized via one-step thermal hydrolysis of TiCl3, grown vertically on the surface of FLG stabilized by ethylene glycol at 150°C for 3 h.
Results: The morphology and microstructure of these resulting graphene/beta TiO2 nanocomposites were characterized by X-ray diffraction, X-ray photoelectron spectroscopy, scanning and transmission electron microscopy, and N2 adsorption/desorption. High-resolution transmission electron microscopy (HRTEM) and N2 adsorption/desorption measurements illustrated the formation of mesopores with mean diameter of 3.8 nm in these TiO2 (B) nanosheets. XRD revealed that the presence of FLG played a significant role in inhibiting the phase transformation of beta TiO2 to anatase during annealing at 300ºC for 1 h in air which otherwise occurs rapidly without FLG. Conclusion: In summary, we have presented a simple approach to synthesize graphene/porous beta TiO2 nanocomposites with tunable morphology. It is expected that this novel structure would be an interesting photocatalyst for the conversion of solar energy to chemical fuels. Keywords: Beta-titania, few-layer graphene, hydrolysis, nanosheet, nanocomposite, porous. Keywords:Beta-titania, few-layer graphene, hydrolysis, nanosheet, nanocomposite, porous. Abstract:Background: Despite recent advances in the construction of graphene/TiO2 hybrids with tunable structure and morphology, the synthesis of graphene/beta TiO2 nanocomposites with welldefined morphology remains a challenge.